Last year we switched to posting in-app release notes much more frequently in our "What's New" widget. Many of you wanted more detail on changes but we let the pendulum swing too far on posting fewer summarized updates. As a result, you might have missed out on additional value while you were heads-down running great events. Raise your hand if you've received the same question 100 times about your events? It's no secret people are in a hurry and that often leads to you receiving incomplete questions. We've introduced a new contact flow which tries to answer questions directly, and if they still need help, sends you a nicely formatted email with helpful links back to the relevant event or registration. This leads to fewer total questions and faster answers for those that need your attention. Roll out the red carpet for first time participants with your organization! Look for the badge on entry lists and check-in screens to offer an extra-enthusiastic welcome or pair them with an experienced attendee. Discount codes can now be forcibly limited to first time participants and the first timer flag can be used in the email blaster and reports. Member types are a powerful tagging capability for segmenting your contacts. You can use them to control who sees what on your registration form, filter email blasts and reports. With this update, you can now batch tag everyone in your contact database, all attendees in an event or something more narrow like just the checked-in participants for a single run group. The kids walk in. The boss calls. The dog barks at the front door. A Facebook notification pops up. There are 500 ways to get distracted while registering for an event and for years we have rescued your abandoned registrations using email to convert distracted potential attendees to actual attendees. As a reminder, we also warn you if an instructor is accidentally double-booked. Have a test day or banquet you want to hide from your public attendee lists? You can do that now. Simply uncheck "Include in attendee list" on the settings. Want to make sure that Thursday, Friday and Saturday are sorted in chronological order instead of alphabetical order? 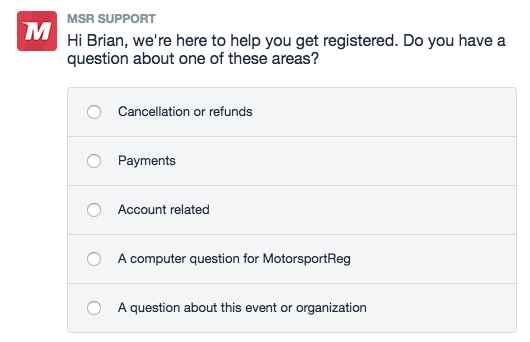 You can do that too: drag and drop to reorder on the Segments list for your event. On each registration screen, next to the name, is a gear icon allowing you to move or copy a registration to one or more future events. 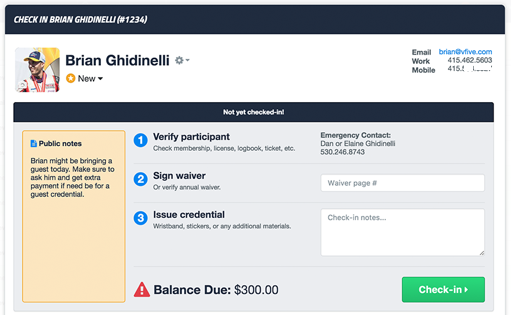 We added the ability to delete the existing registration and handle payments as part of the move/copy process to eliminate a secondary step. Our team regularly goes into the field to work registration and timing at events and witnessed a problem: registrars checking in attendees before an event in order to leave notes for event-day registrars. This was a lot of work and wrecked the audit trail of who actually checked a participant in on event day. It's common for a single participant to have mulitple entries with different vehicles that each require some approval like a tech inspection. 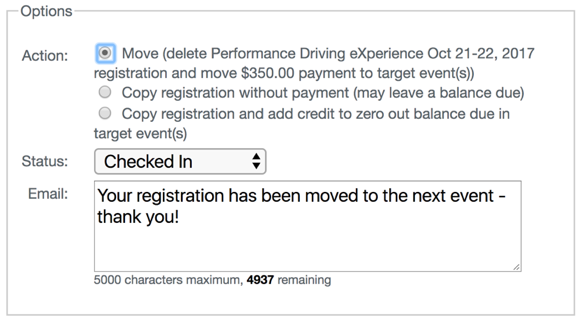 We introduced a new assignment field to record a vehicle status per entry. Organizers in the field track when vehicles are accepted, on site or have gone through tech. The field can be filtered for timing and scoring exports, refund reconciliation and other reporting purposes. The SCCA Championship Runoffs at Indianapolis Motor Speedway last October had nearly 1,000 competitors hit the track. But before they hit the track, they went through registration and the tech shed. And some racers made lots of changes: numbers, vehicles, transponders, sponsors, colors, etc. All of those details need to make it to T&S in order for the racers to be scored properly and the results to be accurate. Even at a small race, more than 100 changes can be made to the T&S data over the course of a weekend. Communicating those changes with paper slips, text messages or fax (yes, fax!) is an extra step with an opportunity for mistakes. Enter our Timing and Scoring ChangeLog. 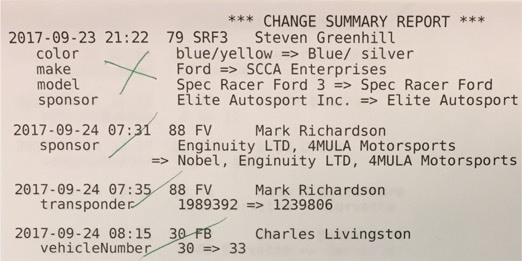 All registration changes are entered into MotorsportReg, like normal, and our special audit log generates a feed of just the changes that timing and scoring needs to apply to their systems. For the Runoffs, three copies of a paper printout were generated and handed to each timing operator who marked them off as they were applied. In the future, these changes can be applied semi or fully automatically to T&S systems to streamline change requests and eliminate data entry errors. Currently this feed is accessible via our REST API. Later this season we will deliver a user interface for T&S operators to review and acknowledge the changes as they are applied to the timing system. Bringing timing staff into MotorsportReg also means race day changes, like new transponders, can be captured to eliminate making the same changes for future races. The highlights above represent key changes from the hundreds of modifications and improvements we brought to MotorsportReg.com over the past year. We release updates several times per week which also included performance improvements, new reports and filters, Developer API enhancements and more. For the latest updates, continue to check "What's New" when signed in as an organizer.